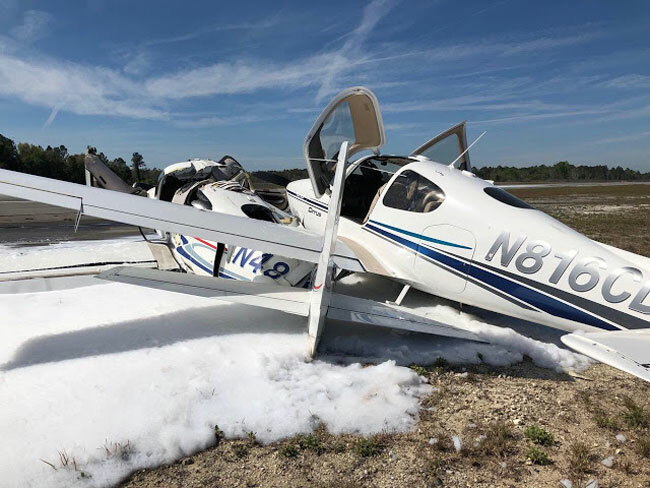 We earlier reported on the crash of two Cirrus SR-series singles, an SR20 and an SR22 at Lt. Kay Larkin Field in Palatka, Florida, which is about midway between Orlando and Jacksonville. The NTSB is investigating the crash. A photograph of the planes after the accident, in which no was injured, showed the textbook signature markings of a prop slicing through the upper fuselage of the lower plane. The markings stopped just inches behind where the front seat occupants were seated. Reports were that there was no backseat occupant in the SR20. The dramatic photo also showed that the whole-airplane parachute in the SR20 deployed, presumably upon contact with the plane landing on it. The usually invisible hatch that contains the rocket-powered chute was gone and there was sign of fire and/or smoke on the lower aircraft. There was also no sign of the cords that attach the chute to the plane, so it’s likely the parachute never left the plane, again, presumably because it was trapped beneath the lower fuselage of the upper Cirrus. Read our initial report here. It looks like mating season for Cirrus. The bottom even popped.